If I had to pick which I prefer more - dressing up or dressing down, I would definitely say dressing up. I'm not uncomfortable in heels, love a gorgeous dress and overall it feels more like "me". But I do like to have outfits in my closet that are more casual instead of opting for leggings and an old tee/sweatshirt combo. So I'm always on the hunt for pieces or a combination of pieces that are appropriate for a casual occasion but don't make me feel schlumpy. I have always said (even since high school) that I don't think you have to sacrifice being comfortable for looking pulled together. You can have both! 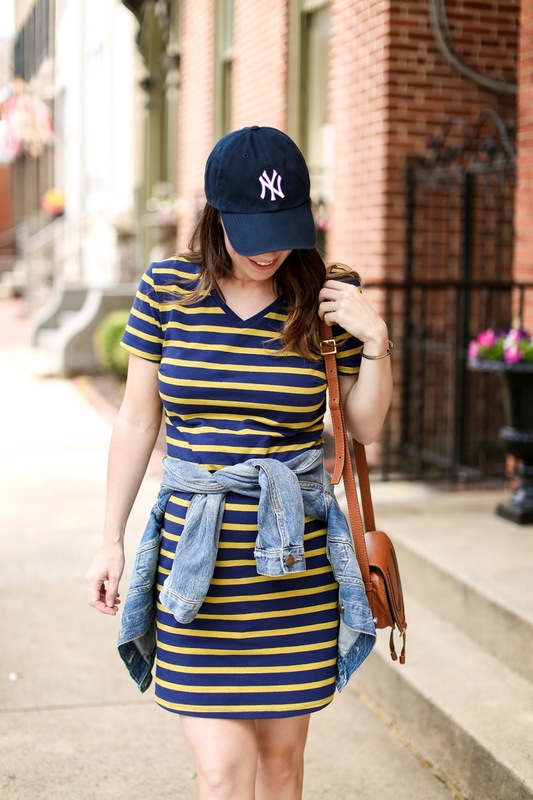 I purchased a few of these t-shirt dresses from Old Navy at the beginning of my pregnancy since I felt they would be perfect for my expanding waistline without breaking the bank, and I absolutely loved them! 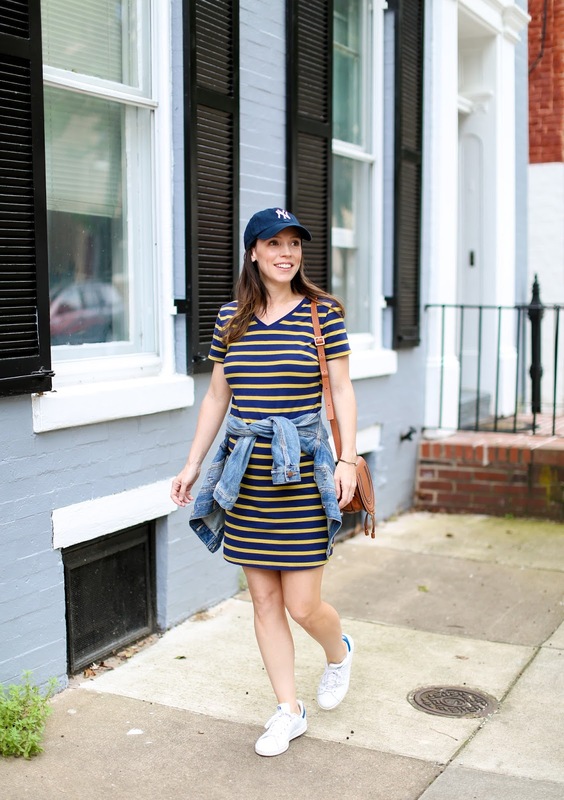 Frankly, pregnant or not I find that they are such an easy piece to throw on and go - with sneakers like in this look or dressed up with flats like I did in this post. Though my days of tying a shirt/jacket around my waist are getting numbered, I still love how it breaks up the monotony of the striped pattern and I always end up wearing it at some point during the day #nevernotcold. 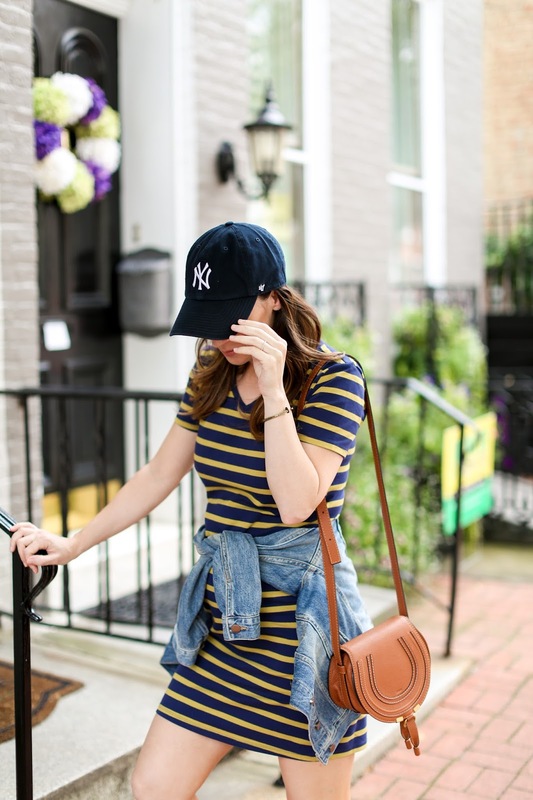 Swap out the baseball hat and sneakers for a cute straw hat and wedges for another option as well - a t-shirt dress is so versatile for this!